Sometimes the Ego is unassuming. It is the Everyman. It is the Everywoman. The Everyperson. Morality, virtue, and equality are important–and when you are an Everyperson, perhaps they are appreciated more than anything else. Among the twelve archetypes, there are none more “centered” than he. 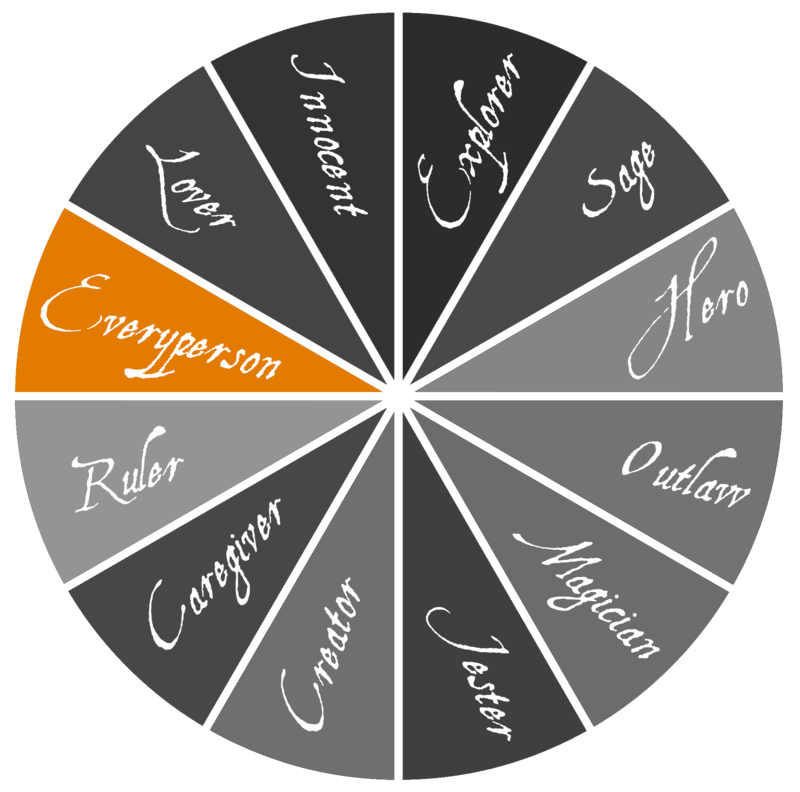 The Everyperson is not just centered in heart and spirituality and education, but also in the “wheel” of archetypes. The Everyperson can easily turn into any of the other Soul or Self types. As I mentioned in my first and second post in this series, this collection of posts deals with the archetypes first put forth by psychiatrist Carl Jung, and the use of these archetypes in fiction. Every post deals with the motivations, character profiles, and Shadows (or negatives) of each archetype. This week is the second of the Ego types: the Everyperson. Sometimes referred to as the Orphan, the good neighbor, silent majority, good old boy, common man, or person next door, the Everyperson is a little bit of you, a little bit of me, and a little bit of everyone else, too. The Everyperson stands on equal footing with all of her peers, and is eager to build new and lasting relationships with all of the personalities that populate her world. The Everyperson wants, more than anything, is security. Her life has been hard: trauma and ordeals have forced her to accept a realistic outlook, and at worst, a terrible cynicism. It takes a while to became a true friend of the Everyperson. To be accepted by her chosen peers is part of the Everyperson’s wishes. And while belonging to a family, a group, a country, or adventure is what motivates her to succeed, the unending desire for acceptance can also lead to loss of self in the effort to please so many others. The Everyperson is virtuous, down-to-earth, and carries indelible empathy for the pain of others. If the Everyperson were an astrological sign, she’d be the Virgo. She is resilient, hardworking, and is most in touch with the consequences of “the quest”, particularly death, as she has had contact with it before. She sometimes has a pessimistic or deadpan sense of humor, which can help her bond with others in tougher situations. On the flip side, the Everyperson is disdainful of elitism, classism, and any other “-isms”–and may even, in her Shadow, turn to the mercenary (or Outlaw archetype) as a way to combat the systems that have caused her suffering earlier in life. The orphan is prone to self-pity, and is often mistrustful of others when forced into a leadership role. Unlike the Innocent, the Orphan tends to demotivate her team members with her constant negativity. She is also willing to be abused if the only other option is to be alone. Anastasia, from the movie of same name, wants nothing more than to find her family, and the place where she really belongs. In a classic Oliver Twist narrative, she sets out with this dream in mind, only to be conned by two men wishing to make a nice mint off of her uncannily similar appearance to a certain Russian princess. (But they couldn’t possibly be the same person!) While Anastasia exhibits many of the Orphan’s good qualities, she also has some of its less favorable traits, including a cynicism that drives others away from her when they start to get too close for comfort. Batman 2.0, or the Batman from Batman Beyond is much like his predecessor. Terry is suddenly and tragically left orphaned when Bruce Wayne comes across him, and pulls him under his wing to groom him into a true hero. The journey isn’t without its bumps. Terry often shows that his anger outweighs his common sense, adding considerable emphasis to the “dark” in dark knight. In the end though, all Terry wants is acceptance, and he gets this from Bruce, which keeps him on the good guys’ side. Jakkin, of Jane Yolen’s Heart’s Blood series, is not only an orphan but a slave. However, these early traumas give him a strikingly realistic view of the world–so much so that he can raise himself up from his status and to freedom. Nowhere is this more apparent than the moment that starts his journey: given the choice between two hatchlings (one sick and one healthy, and one definitely doomed to the slaughterhouse if left behind), Jakkin chooses the healthy ‘chick’. There is no room for the Innocent’s forgiveness in this narrative. Though little explanation is needed for Annie, this feel-good about you, your neighbor, and the world orphan is one of the more positive incarnations of this archetype. Though the Everyperson need not be an orphan in the literal sense, that feeling of overcoming loss is one of the strongest tenants of the Everyperson. Setsuko, of Grave of the Fireflies, is a child doomed to die. While she is an Innocent in the strictest terms, it is her brother, Seita, who is plagued with justifiable pessimism, eventually leading to both of their deaths. This movie pulls no punches on the reality of the war orphan’s plight. Seita is the result of the Everyperson’s abandonment by those he relies on. Bilbo Baggins is a fantasy world’s Everyperson. He is not an orphan, starting his story with a secure home and community, but is the “ordinary” on his journey with the dwarves. This makes him somewhat of an outsider, and soon, his motivation is to gain acceptance from his travel fellows. He gains the trust of the others slowly but surely, even though he often has his doubts about the journey altogether. Ron is the best friend of the hero, and practically invisible to everyone else in the world of Harry Potter. However, it is also his unassuming nature, and his (and his family’s) belief in equality that keep Harry grounded (by treating him normally) and Hermoine accepted (despite her blood roots). “With great power comes great responsibility.” It is with these words that the self-pitying Peter Parker is transformed into a hero of justice, but even so, his Shadow tendencies often resurrect, vying for dominance. Rogue, of the X-Men, is a classic Shadow-driven Orphan. With a power that insures she will never be able to have a physical relationship with any person ever, Rogue is often destructive–not just to herself but those around her. She even (in the comics) puts her loved ones in peril to satisfy her own needs in the attempt to escape loneliness. She is mistrustful, and often blames the faults of her personality on her situation, rather than owning up to any real responsibility. Still, her ability to rally at the end makes her a useful (if at times exasperating) ally to have. The most famous of the Everyperson, Homer Simpson is the guy next door, the good old guy, the common, white-collar man. All are equal in his mind (except maybe Flanders). Self-pity plagues him in his weaker moments, but in general, Homer’s humor and unassuming nature ensure he will always have a friend to lean on. Seth Bullock, of Deadwood, just wants to do right by the world and his fellow man. He marries his dead brother’s wife out of tradition, becomes sheriff of Deadwood, and tries to keep the peace, even if that means making friends with the more unsavory business owners in town. Bullock is able to make allies out of enemies because he judges a man based on their actions, and not their role in society or the rumors that follow them. He is the moral Everyperson, and will not be swayed. I’m enjoying this series. I’ve always loved reading and learning about the archetypes and applying them to my life, people i know. I identify with several, and some more or less at different times of my life. But I’d not heard of the “Everyman” before. In that place on the wheel in my reading has been the “orphan.” So it’s interesting finding a new type. I’m so glad you’re enjoying it, Deborah! It’s a bit of a labor of love, but I’m really liking it myself. It feels good to be writing it, and I’m learning as I go. 🙂 Everyman, as a qualifier, is a relatively new term, but it’s similar to Mother being changed to Caregiver. I think modern renditions of this are trying to make the labels more inclusive. But yes, this was traditionally the Orphan.